Golden Shine Tire & Trim Dressing is a water based cream formula containing modern polymers that coat and bond to all vinyl and rubber for premium protection and natural beauty. It does not contain alcohol or petroleum, which are typical dressing ingredients that can crack or dry your dash, tires, and trim plastics. Golden Shine Tire & Trim Dressing provides the equivalent of 40 spf sunscreen to preserve and protect rubber, vinyl and plastic from harmful UV rays. It produces a semi-gloss shine that last for weeks, not hours like many of the high-shine wet look dressings. The semi-gloss shine is much closer to a new tire look than a wet look. 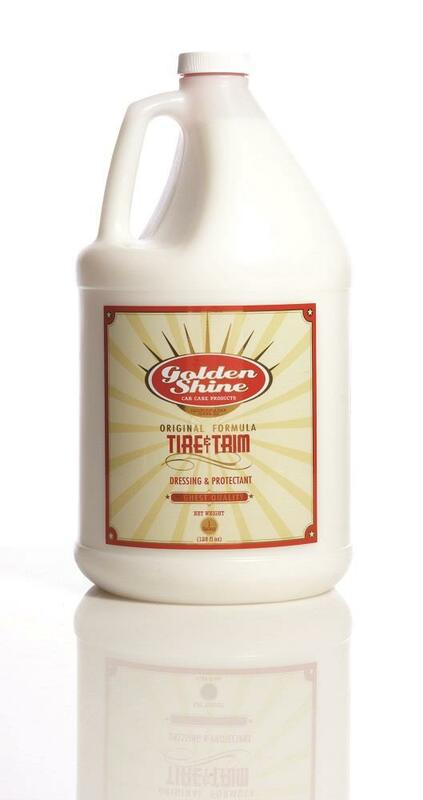 For best results, apply Tire & Trim Dressing with one of our Golden Shine Foam Applicators. The cream formula is thicker than a spray and must be massaged into the vehicle’s tires and trim for best results. Allow Tire & Trim to dry before driving to prevent any slicking or splashing. Want a higher shine? After the first coat of Tire & Trim Dressing dries apply another coat on top of it to provide a higher shine to vehicle trim. Tire & Trim Dressing is the final step to make your vehicle looks its best after a car wash.